Do Alpha-blockers improve outcomes of patients of ureteral stones? 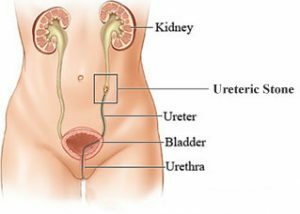 Ureteral Stones stuck in the ureter often cause pain and depending on which part of the ureter the stone is stuck in and the size of the stone, it will often pass into the bladder on its own over the course of weeks.Alpha-blockers are medications that relax muscles in the urinary tract and may make the stone pass into the bladder faster. Dr.Campschroer T and associates conducted a review to find whether medical treatment with alpha-blockers improve the outcomes of patients with stones stuck in their ureter.The researchers found that in patients with stones stuck in the ureter, alpha-blockers likely make passing the stone easier . The researchers included 64 studies with 10,509 participants. Of these, 15 studies compared alpha blockers with placebo with 5787 participants after latest search of the literature from November 2017. The researchers found that alpha-blockers likely resulted in more people passing their stones compared to placebo. However, these patients are likely to experience slightly more serious unwanted effects of this medication. People taking alpha-blockers may pass their stones in a shorter time, may use less diclofenac (which is a type of pain medication), and are likely to be admitted to the hospital less often. Meanwhile, the need for surgery for their stones was similar.They also found that effects of alpha-blockers may be different in people with small (5 mm or smaller) versus larger (larger than 5 mm) stones. It appears that this medication works better in people with larger stones. We could find no difference in how well alpha-blockers work, no matter where in the ureter the stone is stuck or what type of alpha-blocker is used. The Authors concluded that in patients with ureteral stones, alpha-blockers likely increase stone clearance but probably also slightly increase the risk of major adverse events. Subgroup analyses suggest that alpha-blockers may be less effective for smaller (5 mm or smaller) than for larger stones (greater than 5 mm).